At Conaway Motors Inc, we believe that BMW’s are the most technologically advanced vehicles made today! As an owner of BMW, you’ve come to appreciate and respect all that the BMW has to offer. The staff here at Conaway Motors understands the importance of proper maintenance, repair and continued BMW training. That’s why our average technician has over 20 years of experience working on BMW’s. You can trust in Conaway Motors to bring you exceptional repair and maintenance for either a brand new or used BMW. You not only have the expertise of our certified technicians for working on your BMW, but you also have the ability to get any of the advice and guidance that you may need when it comes to suggested maintenance schedules, parts, accessories, and more. At our facility, we feature state-of-the-art equipment for both diagnostics and programming. In addition to that, you have the confidence that you need in knowing that you are leaving your vehicle in the hands of professionals that come with many years on hands-on expertise when it comes to automotive diagnostics and repairs. A little less than a decade after the BMW 2002 was introduced to the U.S., a new vehicle of performance and practicality was born, the BMW 3 Series. While the 3 Series remains the benchmark against which all other sedans are measured today, we have continued expanding our models. And, in true BMW fashion, turning traditional aesthetics upside down. In 1996, the BMW Z3 was introduced, the predecessor of today’s sculptural Z4 roadster. In 1999, we launched a whole new vehicle category with our X5: the Sports Activity Vehicle. And most recently, we’ve introduced the BMW 335i Coupe, the most powerful 3 Series Coupe. Ever. Why Have Regular BMW Maintenance & Repair? When you bring your vehicle in for maintenance at the suggested intervals, you will increase both the life and the value of the vehicle itself. Not only that, but you will also be maintaining safety while preventing potential breakdowns. 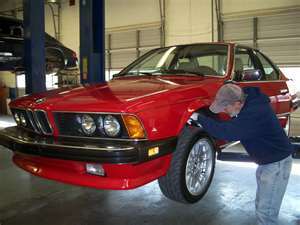 BMW has put out maintenance guidelines, which have been able to keep their vehicles gracing the roadways for decades. At Conaway Motors we understand and live by such guidelines to help you make sure that your BMW is able to bring you many years of enjoyment. Because we’ve always been unwilling to compromise, we’ve managed to build vehicles that thrill drivers. We have the autonomy to stand behind the leading-edge concepts of our designers and engineers. As an independent company, we make sure great ideas live on to become ultimate driving machines. We look forward to the opportunity to service your BMW. For immediate BMW Repair and Service on your vehicle, contact us now.